Despite the best (and worst) the weather could throw at us, myself and the Prof tootled down to London this weekend in the last of our buggering about the countryside convention odyssies. We also got back again (which was something of a miracle), so here I am, replete with biccies and coffee in the comfort of the Pixie hovel, a bearer of good news for those of us who do like our roleplaying games. Cubicle 7 also held a panel where they discussed the future of their gaming empire, including that of our beloved hero's game. 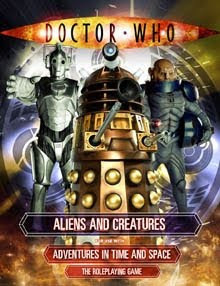 As I've mentioned before, David Tennant leaving the series just as the game came out caused Cubicle 7 some major league headaches, particularly as the BBC rebranded the entire line as well as replacing the lead actors. I will admit that I was very worried about the game's future, particularly as the new version that was due this month hadn't materialised (see what I did there? ), but it looks as if the future of the game is secure for at least the next 12 months, if not longer. Angus & Dom (the benevolent patriarchs of Cubicle 7) were happy to announce that the "regeneration" edition of the game will be available sometime in the middle of 2011. It isn't a new edition of the game as such, mostly having been repackaged with lots of nice new piccies of young Mr Smith (and presumably Mr & Mrs Pond), but there will be updated stats for the monsters to take into account series 5's shennanigans (I've just realised that means i-Daleks, doesn't it? Oh well, can't win 'em all). Rather nicely, a true regeneration pdf file will be available for those who already own the game and don't want to buy the whole thing again in boxed form; it will contain only the new & revised material. The previously planned supplements will then follow under the new logo (the Unit source box, the Companions source box and the original Doctor source boxes, to name but a few). It also became clear just why these things often get so badly delayed; not only is Cubicle 7 (like most roleplaying companies) a tiny affair, existing on the goodwill and devotion of its core staff, freelancers and fans, but having something printed in the Far East then shipped to the States is fraught with Customs & Excise related skull-duggery. Although the BBC insist on all of their partner firms being ethical (so no sweat-shops, despite Dom's insistence that they have an electro-shock buzzer to make the labourers pack the boxes faster), once the sets arrive in the US, they are subjected to whatever the box equivalent of the old rubber glove routine is before they are released to the distributors. Its probably going to be a rubber glove, isn't it? Ew. It was also heartening to hear the feedback the game has been getting from schoolteachers who have been using it to introduce new bodies to the hobby. Every year, someone asks at a panel "So, is the roleplaying industry dying?" and the answer usually runs along the lines of "No more than it was last year". Its virtually impossible for any game to know how well it does in recruiting fresh blood unless people tell you that's what they've been using it for but fingers crossed, this one seems to be doing the trick, at least where its been attempted. Dr Who also made the discussion at the Sunday pub meet-up. Last year we discussed the need for RTD points in the roleplaying game so you could pee-pee away a solid story line and replace it with a desperately unsatisfying ending (and that was before any of us had even seen "The End of Time"); this year we had an in-depth discussion of Doctors 3 & 4. It was getting a bit involved even for me and as a friend pointed out, if the Pixie is finding it too much, what hope was there for normal people? (Cheers, Robin). Okay, so it wasn't predominantly about Dr Who, though there were a lot of Dr Who comics and a lot of people dressed as young Mr Smith (fezzes and bow ties as far as the eye could see). Tony Lee of IDW comics was supposed to be there, but sadly wasn't (he writes Dr Who stuff, in case you didn't know). Still, we managed to maintain a fairly Who-y theme in spite of all the other comic-y nonsense going on around us. Our first triumph of the day was interviewing Mr Paul Cornell. As with all the writers we met last weekend, he's lovely and very kindly agreed to talk to us even though he doesn't do Dr Who interviews anymore. 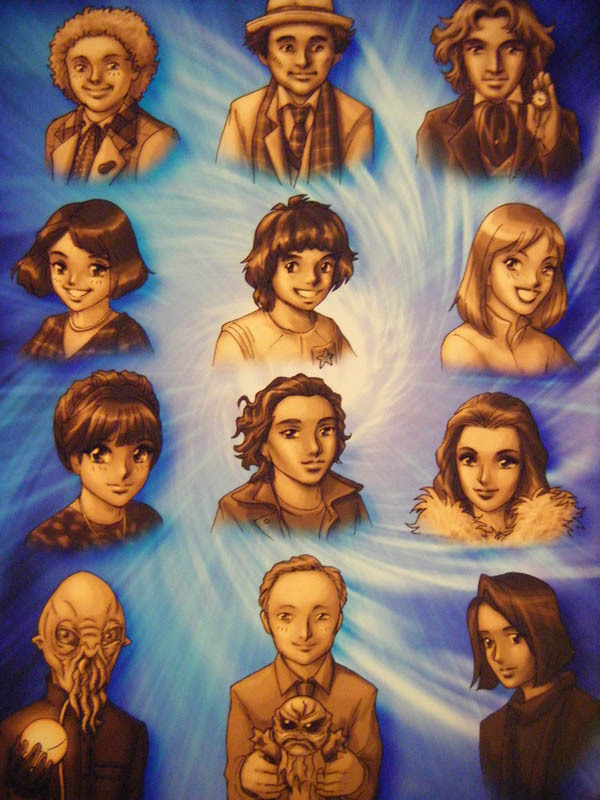 Its just as well we rarely ask anyone about Dr Who, really (bit odd perhaps for a Dr Who podcast but then, there you go, that's us all over). He's nearly as easily broken as Teedles and was a pleasure to talk to. We'll include that interview with the Dimensions Crimble Specials for a fair old festive line-up. We finally got the chance to meet the wonderful and talented Abby Ryder and Dave Bulmer of Dumpy Little Robot. You can see Dave's rather nice legless David Tennant piccie here. 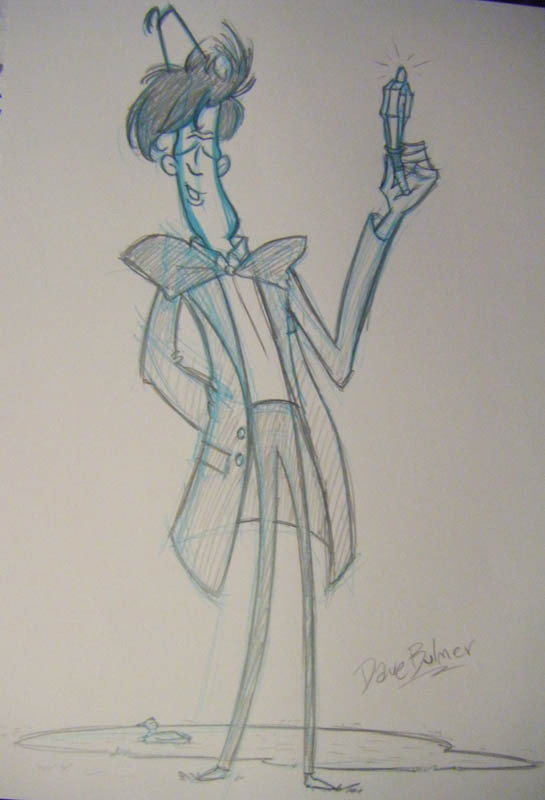 The Prof and I challenged Dave to draw a leggy Matt Smith, which was quite handy as he'd been plotting one for a while, apparently. There's even a duck, Pond! Not too shabby for a non-Who convention, eh? It must be said that I slept better than I thought I would (in fact, we were getting up not long after some of the people we'd been drinking with the night before had just gone to bed). A sense of foreboding hung over brekkie as I contemplated the potential train-wreck of the afternoon's festivities, which our morning encounter with Sylvester McCoy did nothing to dispel. Apparently he wasn't very well all weekend, so that must be taken in to account, but getting his signature was a rather awkward experience for some reason. Colin Baker was as lovely as the last time we met him and we had a coded discussion about his appearance in the Inspector Morse stage play, much to the bemusement of those around us who hadn't seen it. Bless him, he'd piled on to a train on Saturday night straight after a performance in Derby, not arriving at the convention until 1.30am Sunday morning. Yet there he was, just after 9am, smiling and signing away. We chatted with Jennie Linden, who played Barbara in the Peter Cushing movies, about how much we'd enjoyed them (I don't care if they're not canon, they're fun and pretty to look at) and with Nicola Bryant's signature we Pokemon'd out (gotta catch 'em all, y'know!). As promised, the contact sheet by Niki Hunter, provided so that everyone had a handy way of getting all their signatures. Sadly, we didn't get Mary Tamm as she couldn't attend. Neither could Paul Darrow, who wasn't actually on the sheet for some reason. Our one interview of the day was Nev Fountain, writer of "The Kingmaker" (reviewed by your resident Pixie here), one of the two Big Finish audios that the Prof used to introduce me to the Dr Who range (the other being "The Chimes of Midnight" by Rob Shearman). As with Rob and Nick, Nev was very amusing and a pleasure to talk to. We even helped (accidentally, admittedly, just by being geeks) with his research for his next book. 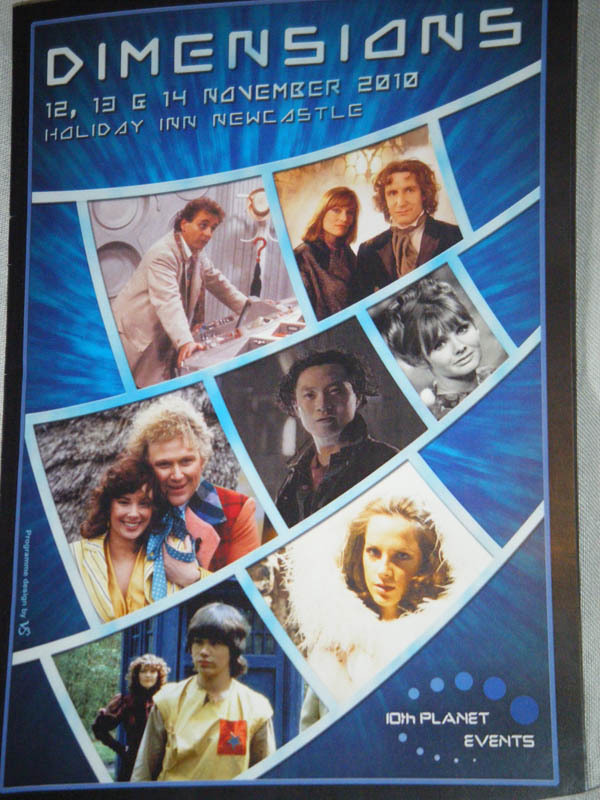 I did feel very guilty about not asking Lisa Bowerman & Beth Chalmers for interviews, but we had kidnapped rather a lot of Big Finish folks over the weekend and after all, we do have to leave someone to talk to the next time we go to one of these things. We did ask for an interview with Mr McCoy, but were politely told to go away (in as many words) by the official handler, which was fair enough really. For the rest of the morning we attended workshops, first with Beth & Charlie Ross on audio drama, then with Charlie & Keith Temple on comedy. Once we'd found the room, we settled in for two informative and cosy chats with on tap drinkies and biscuits and we weren't forced into doing anything embarrassing at all. Charlie's a hoot, and was very forgiving of the Prof's weird taste in comedy. I would have liked to interview Charlie & Keith too, but as official guests they were incredibly busy. Let's face it, I would have liked to interview pretty much everyone there; I enjoy talking to interesting people. Then it was the tea. The event we'd been dreading all day. Finally. We knew it was going to be a bit fraught when the guy told us we didn't need to show him our certificates to get in; we'd made that much of an impression on the Friday night, apparently. John, Neil and Rob were all hiding somewhere else so it was down to the four of us not to stick our feet in it any more than we already had. Things got off to a bit of a shaky start, but feeding cream cakes to people seemed to help a bit. Once Mr McCoy got warmed up, the stories started to flow. Now sometimes people really annoy me. We weren't the only ones at this tea; there were raffle and auction winners there as well. Sadly, some of them were socially inept at best and downright rude at worst, completely ignoring and in some instances talking over Daphne Ashbrook and Yee Jee Tso when they attempted to answer questions. They seemed determined to have Mr McCoy trot out all the same old stories - heck, I'm not a fan, but even I'd heard most of the ones he related over the profiteroles. We tried our best to ask questions that would make sure everyone was included in the conversation, but when you're up against people asking Miss Ashbrook if she's ever known someone who comitted suicide, you know you're on a hiding to nothing. (This might sound dreadful, because Miss Ashbrook & Mr Tso were very nice, entertaining people, but we were sort of wishing we could have gone to the tea with Jennie Linden instead. It would have been far less painful in the long run. Sadly, I get the feeling that Mr Tso is quite used to people pretending he isn't there, which made me feel ashamed on behalf of human beings in general and Dr Who fans in particular). But we stayed and eventually asked one of our favourite questions: if you could be a biscuit or cake, what sort of biscuit or cake would you be? Although we don't have any audio, for posterity the replies were: Nesquick biscuit mix (Miss Ashbrook, 'cos her Mum used to make them for her when she was little), Walker's butter biscuits (Mr Tso, because apparently they're very rich and buttery) and custard pie (Mr McCoy, because he was on Tiswas with the Phantom Flan Flinger). We emerged relatively unscathed after an hour (the scary man who'd muttered angrily at us all weekend turned up at one point as well, just to really make it as odd an experience as possible), full of cream cake and, as the convention was officially closed by the time we escaped, ready to say our goodbyes. We were tired but content, if a little weirded out. No matter how good these things have been though, there always comes that point when you just want to go home. So after many hugs and exchanges of details, we did just that. My only real grumble for the weekend was the location. Not that there was anything wrong with the hotel. Far from it; it was warm, clean and comfortable and the staff were lovely (although the Ladies loos could do with some redecoration). Its just that the North East is a beautiful part of the world and it really wasn't showing it off to its best. Once you were there, you were there. At least if it had been in Newcastle, or Durham even, people could have seen just what this area has to offer. Yes, it would have made it more expensive but I think it might have been worth it (especially for the invited guests). Overall though, it was a smashing weekend, full of generous, warm people who we instantly felt at ease with. Neither of us have laughed so much in ages. The Big Finish team really made it for us, along with Richard, Alan, Neil and John (our pub quiz partners in crime) and the lads from Saturday night. Its easy to see why Dimensions in particular has such a good reputation with the fans and why so many people keep on coming back year after year. We certainly will. After we spoke to Mr McGann, we gathered the signatures of the other actors and writers (Daphne Ashbrook, Yee Jee Tso, Matthew Waterhouse, Andrew Smith, Beth Chalmers & Keith Temple) on the rather natty contact sheet provided by 10th Planet. The Prof thought it a terrible shame to get people to scrawl all over it, but it was specifically created for that purpose so I didn't mind too much. It was also entertaining to watch the celebs trying to fit dedications in to the teeny tiny spaces available (I'll let you have a look at that in the final installment). Mind you, I think it was a bit unsporting to have Keith represented by an Ood; he's a smashing bloke and much better looking than old squid-face Sigma. To add to the haul, we also grabbed Charlie Ross' book, even though he made us take a piccie as well (he's a hard man). The Prof wanted to pop in to see the Big Finish crew and pick out his Crimble pressies (see the stash above) and we had a very pleasant chat with Lisa Bowerman about which CDs we should get (she even signed a fair few for us as well). The Prof bought me Nev Fountain's Mervyn Stone novels for my birthday, so I didn't do too badly either. Oh yes, and we picked up Rob Shearman's books as well, including his book of plays "Caustic Comedies" (the only other plays I own are some of Shakespeare's; I'm trying to be cultured here). 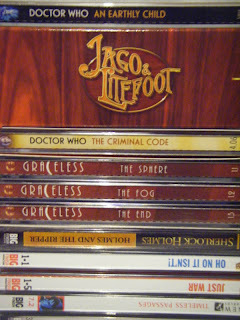 Fortunately our room was only a few doors down from Big Finish, which was just as well considering the size of the haul we'd acquired by that time. We continued in the same vein by going to the Big Finish talk, which was highly entertaining, although slightly worrying in some respects. Reading between the lines of this and other talks we saw (and this may well be my own misinterpretation here), there seems to be quite a degree of tension building in the BBC and television in general regarding intellectual properties and allowing writers to do their jobs free from management interference. It certainly left me concerned for the future of shows like Dr Who, which more and more seem to be under the control of bean counters rather than creative types. After another voyage across the Muto wasteland to the Little Chef for lunch, we were back and raring to go. We began the afternoon in business mode by interviewing an old friend of ours, Dalek Bruce. He's not exactly friends with Oolon at the moment though, after comments made in a certain podcast, but you can hear that for yourselves when the Prof's finished editing the Dimensions Crimble Specials. Flushed with success, we borrowed Nick Briggs from the Big Finish room and had a very lovely chat with him about his life, work and future ventures. He's an interesting and erudite man and I hadn't realised how long we'd talked for (he also complimented me on my interview technique, which made me squee ever so slightly). He then let us borrow Jake McGann (Paul's son) to find out all about possibly the world's greatest bit of work experience and playing the Doctor's great-grandson. He was slightly bemused that we didn't want to talk to him about his Dad, so we forced ourselves. Just for Terry, you understand. Sadly we missed Nev and Nicola Bryant reading from Nev's novels, and the writers' workshop with Andrew and Keith, but we did blag an interview with Mr Shearman (if you can't hear the Prof guffawing his head off in that one, it'll be a miracle). Lets just say that we now have a South Bank Show Memorial Question and a terrible reputation forming amongst our interviewees (don't, whatever you do, look under the bed). Finally, it was time for the drinking to begin again with the Tachyon TV crew and all their amazingly entertaining friends, including PJ, who does the most frighteningly accurate Tom Baker impersonation I've ever seen, and Bob Fischer from Radio Tees, who has a rather nice Tom Baker scarf. I was designated Pixie, I will admit, but I spent most of the evening crying with laughter without the need for any booze whatsoever. We learnt all about the Mayor of Scotland (don't ask), Kenneth Branagh & Brian Blessed's football watching antics (really, don't ask) and even came up with a plan of attack for the rapidly approaching afternoon tea with the stars (I'll never be able to hear the word kipper again; but seriously, don't ask). We wimped out before midnight, tired, happy and sore with laughing so much. My last memory of the evening was John William's disembodied voice crying "Why? WHY?" as we wandered off to the Land of Nod. 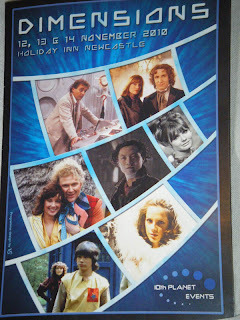 The Prof and I have just returned from Dimensions, which rather conveniently took place just up the road from us. We hadn't been sure whether to go or not, but a conversation with the rather smashing Dr Who artist Steve Caldwell at Whooverville convinced us to give it a go. Still, it was a bit nerve-wracking turning up on Friday night knowing nary a soul. We got there just in time for the pub quiz, usually a pastime of massive bewilderment to me at conventions. It never seems to matter how long I've been involved in the field, or how widely read I think I might be, when the questions start I'm at an utter loss. They're invariably so pedantically precise and searching that I tend to sit there like a flabbergasted guppy. We nearly didn't go, but in the end thought we might as well start how we meant to go on by embarrassing ourselves thoroughly and earning the righteous scorn of our peers. When we entered, we spotted the venerable Messers Perryman & Williams, purveyors of all things Tachyon TV. Having decided not to start the celebrity stalking quite so early in the proceedings, we instead surreptitiously lurked in the row behind them, nudging each other occassionally and whispering "That's them!". However fate, and our charming host, intervened as teams of two were strictly forbidden, forcing us to throw ourselves on the mercy of these podcasting demi-gods. Four wasn't enough either, so we co-opted two lovely gentlemen from the row in front. Then another few people wandered over, one of whom was a vaguely familiar beardy chap and another one who was Paul from Big Finish (we met him at Whooverville too, where he was on the podcast panel with Oolon). Having formed our team, Rob Shearman, for it was he, named us "Fuschia From the Deep" and it all went down-hill from there. The quiz was hysterical, not least due to some comedy spelling (Bernard Cribbons, indeed!) and some very contentious answers. It soon became apparent that we were the naughty team, because we were laughing and enjoying ourselves. Much to our horror, we were also winning (perhaps this would be a good time to point out that the prize was afternoon tea with Sylvester McCoy, Daphne Ashbrook & Yee Jee Tso). To be fair, we were only taking part for a giggle, but some of the other teams were desperately serious about the whole thing and it didn't go down very well when we did eventually claim our victors' crown (at least, not with the team that came second, one of whom decided to mutter darkly at us every time he passed us for almost the entire rest of the weekend). Having been kidnapped and dragged across the Muto wasteland around the Holiday Inn by Mr Shearman on a quest for sustenance and a BLT sarnie, we returned older and wiser in time for a fair old drinking sesh with a wide variety of rather lovely people. Andrew Smith (writer of Full Circle, first of the E-Space trilogy, and introducer of Adric) gallantly shared a bottle of red wine with us at one point and lots of Big Finish people wandered by to pass the time of day. We learnt how not to put our foot in it with a potential interviewee, heard some wonderful gossip (none of which will ever be repeated in any way, shape or form so don't ask), found out more about Pointless than we ever thought was possible (hi Angela!) and eventually wandered off to bed at 1.30am. Was it a well written & researched pub quiz? No. Was it an ideal way to get a bunch of potential strangers to interact with each other? Yes. It would have been a very different weekend for us if we hadn't gone along, so even though at times it was buttock-clenchingly awful, this Pixie will always have fond memories of it. 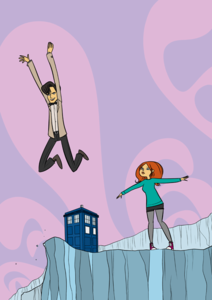 Posted on his tumblr blog "Quarries and Corridors" by Nat from the Doctor Who podcast "Bridging the Rift".